Best described as an explosion of light, Yasmin has a natural gift to help others believe in themselves and connect with conviction. She has an unlimited reserve of empathy and an unyielding spirit which enables her to work seamlessly with her clients. Yasmin’s method of life coaching helps individuals to reconnect with their consciousness and intuition, to awaken a place within themselves, where they can imprint their own intent on the Universe rather than passively receiving an imprint from existence. Everything in nature has a purpose and she works with clients to understand that they are no exemption. 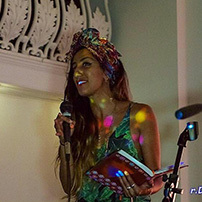 Armed with an academic background in Psychology, a deep rooted ambition to help others and creative expression through dance, poetry, music and art, Yasmin lives her truth daily, in order to be able to help others live theirs. She holds powerful talks at events to spread as much positivity and love to others as possible. From as young as four, Yasmin has taken on humanitarian projects; her latest being a heavy involvement in the refugee crisis since. She’s been a tireless and passionate voice for those that don’t have one through campaigning and volunteering in camps to provide aid and one-to-one support. Her recently launched movement Stand for Humanity https://standforhumanity.tumblr.com promotes One-ness, a concept from her Sikh and Indian roots, which aims to get more people taking ACTION through love; essential for the times that we are in. Her drive comes from a relentless passion that every human being is equal and that true One-ness can only be achieved when we come together FOR each other.